A small collection of bookmarklets for social websites. GraphFi is a visualization/navigation tool for metafilter. It displays a chart indicating the number of times a comment has been favorited and the reply/quoting relationships between comments. It also inserts anchor links and replies into the comment feed to assist with "threading". Drag this bookmarklet to your bookmarks bar, or right-click and "bookmark this". When in a metafilter discussion, click it to augment the page. 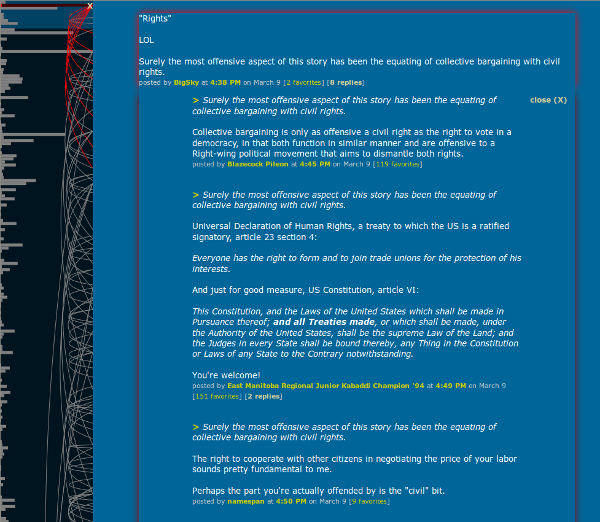 Works on any metafilter post page (talk, blue, green, etc); most useful in larger threads (50+ comments). NOTE: will not function properly in Internet Explorer of any version (not even IE9). Adds a tiny icon to the twitters' favicon showing the number of unread tweets. Drag bookmarklet to your bookmarks bar, or right-click and "bookmark this". But if you're using pinned tabs, or if the tab bar gets crowded, then the toolbar is all like , and you can't see how many twits you've got. and the collapsed toolbar will be all , ergo, win. Built with the awesome Tinycon.